A reminder to One & All that it is the Time of Year when we, in the deep of the Lunigiana, get more than our fair share of O2. Global Warming ought to figure out better Distribution System. I think Africa could stand a bit more water. And hey! It ain’t far away either. Two years ago… in this period of late October… Aulla and the Cinque Terre towns of Monterosso & Vernazza were devastated by flash flooding. Many in Aulla described the flooding as a tsunami. One minute there were a couple of inches of water and in the very next 15 feet!!! It took months to excavate these communities of sludge & debris. 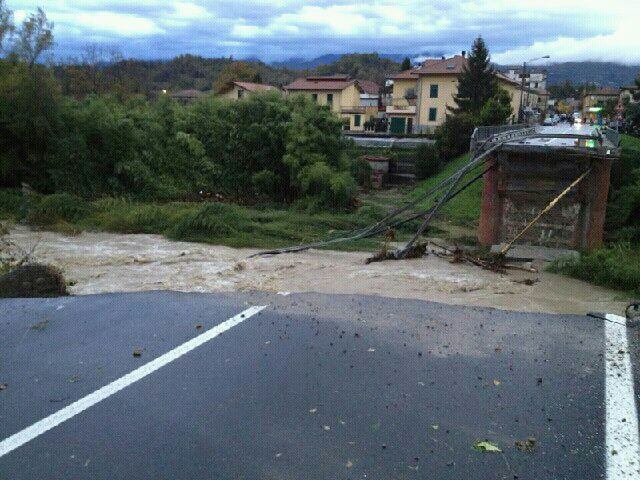 A year ago… and, again, in this same time-frame… Codiponte and other villages about were cut-off from the World by mud-slides after days of torrential rains unleashed their fury. Ill-thought out road escarpments were the main victims. Practically all these now have… what an American friend so happily referred to as hair-nets… to keep Mother Earth in tact and in place. What are so unsightly are the waist-high concrete barriers to hold the cables tying the nets down. Oddly, none are graced with colorful graffiti. And earlier this week and right on schedule, as always, una bomba d’acqua put the Big City of Aulla… again and in a jiffy… under 5 feet of water. The city’s post-WWII sewer system, now taxed with 3/4’s more users than in the sunny Italy of the 1950s, could not handle the massive quantity of rain-water in an afternoon’s deluge. One of the key suppliers of local employment… i.e. for many young people from Codiponte… the CONAD in Terrarossa has been KO. Not my favorite grocery-store, but still. On a lighter side, the earth & rock & metal tubes of the Codiponte tangenziale is nearly no more. And this is the fourth time this ridiculous infrastructure has been washed away. Is it so hard to do the Math here? The forecast is for rain with brief respites of sun. Let’s hope for more sun than predicted. Gads. OK… we’ve had major bridges-washed-away & mud-slides galore flooding last Fall and the year before… we’ve had a 5.2 earthquake + 2,000 after-shocks between June and now… so what happens? I trudge off an airplane parked on a 115F ramp, drive back to Codiponte in an un-AC-ed FIAT, only to hear of several UFO sightings in the evening sky above the Lunigiana whilst away in the US of A? Even Our English Friends saw something similar to the flying gizmo in the above photo. Gosh, I want to see an UFO!!! Do you think these Aliens Creatures in their crown-like vehicles have come to lend us a hand with our various disasters? Offer us their condolences? Have us up for a buffet dinner in their space-ship? Maybe they know the secret about how to control natural disasters caused by Global Warming or from Mother Earth’s ire? I might try & flag one of them down, if only I knew where & when to look. It’s getting critical here, just from the daily Highs. If these Aliens can zip around as they do, surely they have The Goods, since they are so smart to break through into Our Time-Space Continuum, causing consternation and, perhaps, a bit of fright too. I have a few Questions though to ask!!! Gads. Looks like an improvement after 24 hours of pelting water but, unfortunately, it’s back to raining as I write. Gads. bridges swept on down da rivah ahnd on owt ta’ da sea… mud slides stemmed quickly with 5 feet high reinforced concrete retaining walls with… as a friend calls them and this makes me chuckle… hair nets for no-fuss Mud Control…. bulldozers back-‘n-forthing with their labors even after two weeks of steady earth-moving Flood Control employment… rivers which have completely changed their course by several hundred yards!! !… dirt roads AWOL… and other water-bourne disasters. No sooner had I tootled by the ONLY road sign for Codiponte, I slammed on the brakes to talk with My Dutch Friend and her Milanese Husband. They were climbing up to their home isolated by a series of mud AND rock slides that Fateful Weekend. I was informed that where I had abruptly planted My FIAT was under 6 feet of mud & debris from a nearby landslide. I was too stunned from seeing the Aulella River careening down a totally new water way about 200 yards from where it once coursed along the Strada Statale 445 to make any remark beyond… Wow! Later A Big WOW!!! hit. Here is what I saw from Our Scenic Overlook at il Poggiolo… if means a lot to me ’cause I know what it was like… no more river bed trees… ANYWHERE!!! By the way, isn’t Codiponte a charming place in this view? Garbage dumpsters galore. Oh! And, can anyone spot The Dog? AND tell me which one it is too?. I’ll give no hints. A bulldozer had cleared the mountain of tree-trunks, limbs, branches, entire trees AND Assorted Refuse from the Medieval Bridge, pushing it over to The Wall to be buzz-sawed and carted off by any locals interested in a Life-time Supply of firewood. Sorry I missed that. We’re kind of low on firewood. Here’s a close-up of the rubble which nearly swept away the Medieval bridge. And, it is often the rubble which does the washing away. It reminds me of A Really Good Hair Day for Phyllis Diller… bless her heart. Oh, well, one more shot and let’s adjourn for dinner. Gads. After-flood Reports have pretty much dried up, much like the flood waters of last weekend. One Codiponte Friend did send me a rather hysterical e-mail… with not a drop of ha-ha-ha either… describing her exasperating car journey to & from Aulla on Tuesday last. I replied… Breathe!!! Have had no further communications. Was I rude? Two years a go a huge rock slide forced the closure of the same track of road where the bridge went out last Sunday. It just meant a meandering drive over Hill & Dale to reach Aulla. Got to see some scenery otherwise unknown to me. I imagine now the same. Otherwise, many of Our Codiponte Friends have spoken of a quiet return to Normal Life in the village and a patient resignation about the long & circuitous drive to Civilization down in Aulla. The Capitano del Meteo has predicted sunny weather for the next few days. I’ll let the Balkans deal with flooding for a while. Gads. The flood waters have abated!!! The mud & rocks slides on the Strada Statale 445 have been bull-dozed clear, restoring, once again, the vital communication link between Codiponte and the tiny part of The Known World… which, if you were to ask the Tuscan folk their Opinion, they’d say, Tuscany. They are so snotty!! !… called the Lunigiana. What a wonderful invention the bull-dozer is. Every family ought to have one. So handy. Like… Hey, honey! I think I’ll go bull-doze the rock slide out of our back yard. And you could do it, if you had a bulldozer in your Esseccatoio or cantina. Or, how about… Hey, Honey! Me and the Guys are goin’ down to The River and open her up some!!! What fun, no? So collective… gosh, so Commie… Sorry, I got carried away. Meanwhile, towards Aulla, the Authorities keep closing other state roads for fear of more mud & rock slides along the critical route. Our English Friend, newly reconnected with her just re-established telephone service, said the car trip between Codiponte & Aulla is tortuous. Gosh. And, All is Well at il Poggiolo!!! My Intrepid Scout & Dear Dutch Friend paid the place a Visit of Inspection. She said it was very peaceful. So different from Genoa. So, the sun shines…. the temperatures are mild… and I am going to cook for You a fresh porchini mushroom pasta tonight made with a delectable white wine sause. Yum-yum. Gads. The bridge… well, what’s left of it… at Serricciolo yesterday morning. Gads.